How, exactly, does her costume work? Cloak & Dagger is, at its heart, a classic “coming of age” story. And, as such, it’s often simplistic in its portrayal of the various aspects of the story. This is an established—and beneficial—feature of YA stories. 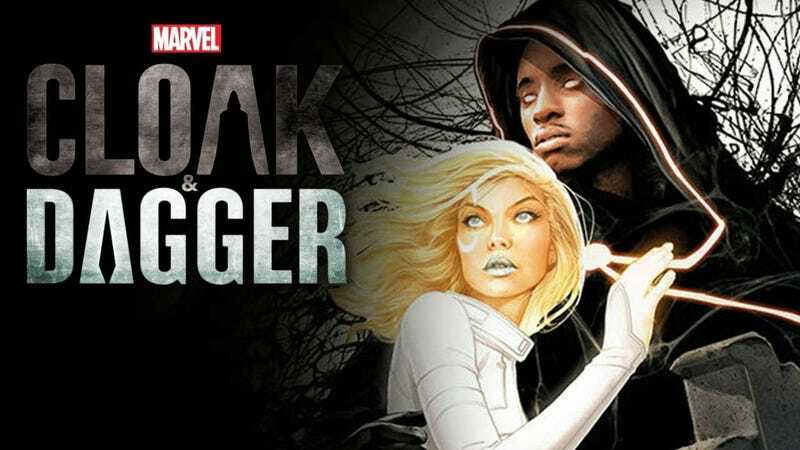 Cloak & Dagger is trying to create a story of discovery, focusing on two characters who are complex enough to be interesting, yet simple enough to have broad appeal. While they have kept the basic physical and “power” aspects of the characters the same as in the comics, they have swapped the familial aspects, and tweaked the details to fit the new situations. They’re doing this in an effort to get away from old stereotypes and cliches. They’ve also moved the story out of New York City and into New Orleans. I’m not sure of the motivation behind this, but I suspect it’s two-fold: 1) to allow for an environment that accepts “magic” and 2) to provide a distance between this story and what’s happening in the rest of the MCU/MTVU—while still allowing the possibility of a shared universe. Setting aside the fact that absolutely nothing about the show says “this takes place near the bayou, they’re doing exceptionally well. Both Tandi and Tyrone are solid, convincing characters. The “young child” introductions set up their foundations very well (without relying on too many cliches), and the contemporary depictions build off of those histories in very “organic” and convincing ways. Where I think the team really excels is in the realism. With YA stories, it’s easy to fall into traps and pander to the audience—treating them like simple children rather than complex, intelligent, “young adults”. Excluding the “very dramatic because it’s a show about super heroes” aspects, everything feels natural and familiar enough to make us believe in the characters and their choices. More and more, American culture is “infantilizing” people in high school and college. The level of maturity and responsibility expected from someone of 14 when I was young is now often considered “too much” from someone of 24. Which completely ignores the fact that “young adults” are facing the same issues now, that they faced 40 years ago. Cloak & Dagger respects their young viewers. It understands the issues that high school students deal with, and portrays these situations in a way that is realistic (excluding the super powers), and which respects the viewers. Young people only become “vulnerable children” if we make them that way by failing to teach them how to be strong. Shows like Cloak & Dagger (and The Gifted and Runaways) show that young people are strong, are resilient, can shoulder responsibility, can step up in the face of adversity, and will be the people we depend upon as we grow old. I’m sitting at the half-century mark (I never get tired of saying that), and I’m anxiously awaiting the next episode of a show that’s targeted at viewers one-third my age. That’s how good Marvel is at understanding the diversity and complexity of their audience. I’m not expecting Shakespeare or Chekov when I watch Cloak & Dagger. But I’m getting a well-written story, and well-depicted characters, that keep me coming back to watch more of the story. The “Young Adult” demographic is fairly well established, and nominally brackets consumers in the ages of 12-18 (inclusive). The “New Adult” demographic isn’t entirely settled yet. Some consider it to be 18-24, others consider it to be 18-30. Personally? If you’ve been an adult for 40% of your life, it’s not “new”. See my post on the Aristotelian concepts of Sympathy, Empathy, and Catharsis. My one major issue with the show is: In no way does this sound like New Orleans. Absolutely everyone on the show speaks “American Standard English” (which is appropriate to Dubuque, Iowa). I don’t expect everyone to talk like Justin Wilson, but... some indication of local dialect would be appreciated. Just... an occasional “Nawlins” or “Loo-zee-anna” would be nice.